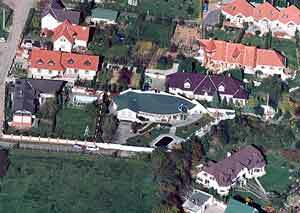 We are located in Pécs, HUNGARY. It is about 200 kms from Budapest to the south-west, and 350 kms from Vienna. Still no idea, where is Pécs? Click here! I was born in 1957, in Pécs, Hungary. I had my first dog in 1975. It was a St.Bernard. With this dog I've been traveling Europe and winning many cups. I was breeding this breed for 20 years, and in that time I've found many friends from Italy and Germany. In 1994 I've found a new "love", the Newfy. I bought my first Newf puppy a black and white one from England's KARAZAN Kennel. In 1996 my second dog was born, SKIPPY, with whom we've had a lot of success, and since then he has been the determining factoc in our Kennel and on the American Type Newfy. In 1999 we got Norman, who was born in the States in Pouch-Cove Kennel. In year 2000 we had a litter from Skippy's daughter Alicia, from where we kept a little girl called Mimi. Mimi is 8 months old now (2001 March) and developing very well. Our newest pup is Skippy's son from an Austrian-Danish litter. Hi name is ÁTOK. He is so funny and I think he is too hot-blooded puppy. I am also an FCI judge in Group I. and II. I was judging nearly all the countries in Europe, and New Zealand as well. 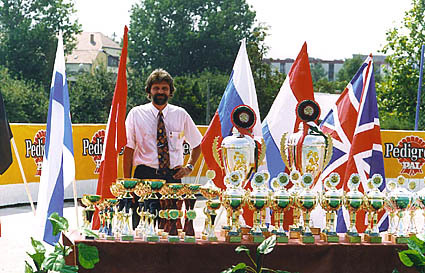 Sine 1996 I am the president of the MEOE-Pécs. Welcome to our little homepage, enjoy yourself. If you can't find what are looking for, please contact us.